Sun Hong-Lei (background) and Aaron Kwok (foreground) in Silent Witness. The Skinny: Involving if unsubtle legal thriller with a strong lead performance from Sun Honglei and solid turns from Yu Nan and Aaron Kwok. Solid storytelling and a few genuinely riveting twists shore up a sometimes hammy script. Mainland legal thriller Silent Witness delivers the goods despite occasional – and also familiar – flaws. 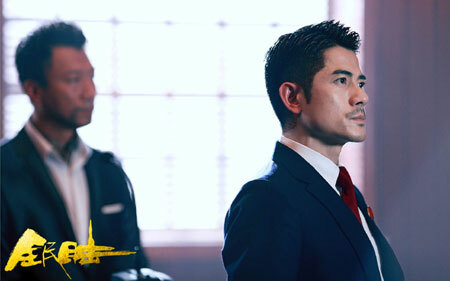 Aaron Kwok stars as Tong Tao, an intense prosecutor working on a sensational murder case. Lin Mengmeng (Deng Jiajia) is accused of murdering the cheating lover (Cica Zhou) of her father, financial entrepreneur Lin Tai (Sun Honglei), and Tong Tao would like nothing more than to stick it to Lin Tai by putting his beloved daughter away. For ten years, Tong Tao has attempted to indict Lin Tai for white collar wrongdoings, but Lin Tai has proven as slippery as he is successful. During the initial hearing, Tong Tao seems to have the upper hand, with all evidence swinging the prosecution’s way. However, when a key witness takes the stand, high-priced defense attorney Zhou Li (Yu Nan) quickly turns the tables. The win now seems assured for the defense, but Tong Tao suspects that Lin Tai may be using his formidable power to obstruct justice from behind the scenes. Silent Witness opens with television news voiceovers introducing its main players like fighters in a WWE grudge match, but soon surpasses that cheesy intro with solid courtroom drama and clever storytelling. After witnessing the initial courtroom hearing that tips the case towards the defense, the film rewinds to take a closer look at Tong Tao, following his perspective as he witnesses Zhou Li’s reversal in court. Tong Tao then receives an email tip from a pivotal “Silent Witness” to the murder, but after that revelation the film rewinds again…and then again, as both Zhou Li and Lin Tai get similar flashbacks and revealing focus. This non-linear storytelling was used previously by director Fei Xing in his Man Behind the Courtyard House, with the flashbacks adding unseen layers to the sympathetic madman played by Simon Yam. The Courtyard House flashbacks also offered new characters and tangential situations, creating an unfocused but also unexpectedly playful genre film. Fei Xing refines and focuses this technique even further for Silent Witness. Rather than exploring one person as in Courtyard House, Fei performs the trick on multiple characters, frequently changing the narrative and audience expectations. Each flashback answers questions while also asking new ones, with some characters being revealed as far more than they initially seem. Indeed, Silent Witness is at its best when it’s adding depth to its characters and the actors perform their roles quite well. Aaron Kwok is the least impressive, always posing and gazing pretentiously, but he’s not given much to do. Actually, the order in which each character is revealed – from Tong Tao to Zhou Li to Lin Tai – allows each actor to trump the previous one, with Yu Nan’s intelligence and integrity proving more compelling than Aaron Kwok’s patented intensity, and Sun Honglei eclipsing them both. Among the film’s team of actors, Sun is easily the MVP, delivering a layered performance highlighted by remarkable underplaying.